Review: Who doesn’t love an action packed book with adventure, humor, time-traveling, battles and dragons?! 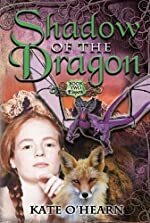 The book, Shadow of the Dragon: Book Two Elspeth by Kate O’Hearn (the second in the series) has everything! With a book like this and an exciting main character Kira and her group of friends (the dragons riders) you’ll never be able to put it down! Our story begins with a group of dragon riders (people that ride dragons –hence the name) Kira, Elspeth , Kahrin, Dane, Shanks and a fox named Onnie that escaped the perilous hands of the evil Lord Dorcon in order to fulfill an ancient prophecy. “One day, a young girl astride a twin-tailed dragon will destroy monarchy and change the world forever…” Now of course the King Arden doesn’t want his monarchy to be destroyed, so he obviously doesn’t like this and is set off to kill them. They are sent by a wizard named Paradon through the Eye which is a time-traveling device. Everyone gets sent into the future except for Elspeth and Onnie who actually get sent into the past! While Elspeth struggles to find Kira, Kira and the rest of the gang are actually fighting people in the 20th century! Will Onnie and Elspeth make it home safe? Will Kira and the rest of the gang live to see Elspeth again? I think this book is great! It is full of many humorous passages such as “You see that pond over there? Why don’t you go soak your head?” Plus, there are many descriptive passages that made me see what the author was trying describe like “The combined power of the merging stones knocked everyone to the floor of the cottages was filled with a blinding flash of colors and a tremendous peal of thunder that echoed throughout the village.”. The characters are realistic as well and act like normal people for their time and say things that they would have said. Plus, because the setting took place a long time ago, when the group got to the future they are surprised to see modern things like fridges and televisions. That makes sense because the group couldn’t possibly know what fridges and televisions are. My favorite character is Kira. This is because she is brave and determined. I also like her because she picks on Shanks a lot in funny ways. I also think that because the book switches view from Elspeth and Kira, you get to see the whole side of the story which makes it neat. Going from the two characters tells you each side of the story. Additionally, the book uses many different feelings and makes the main scenes all different from previous scenes, making you not sure what to expect next. The only thing that disappointed me was that when reading the book, you needed to have prior knowledge from the first book. I think that the book should have summarized the previous book so that you would know what happened before. All in all, I thought this was a really good book because of the setting and the characters. I love how the author used her imagination to create the wizards, plot and the dragons. Plus, it really warms my heart to see that two sisters are fighting to see each other again. I give this book 4.5 out of 5. I really enjoyed reading this book and know that you will too. Review written by Sarah (6th grade student). We would like to thank Kane Miller for providing a copy of Elspeth for this review. Have you read Elspeth? How would you rate it?